Here is the list of top Social Bookmarking sites. I got this list from MySeoBlog and they have compile these list in alphabetical order. For those who don know What the use of these websites is to promote your blog articles or even your site, but keep in your mind that not all of this site has Pagerank and do follow attributes. Allmyfavorites - Create an organized page for your bookmarks that you can share with friends and family, access from any computer. Backflip - Check out the most popular links each day, set “The Daily Routine” as your homepage so you can visit your must stop sites each day with ease. Barksbookmarks - is a website that combines social bookmarking, blogging, RSS, and non-hierarchical editorial control. Bibsonomy - BibSonomy is run by the Knowledge Data Engineering Group of the University of Kassel, Germany. Its specifically designed for researchers, in sharing bookmarks and bibliographies. Blinklist - Social bookmarking with slick interface and new ways for organizing tags. Blinkpro - Dynamic folders, bookmark all links of a page plus all the usual features. Blipoo - Meet Blipoo, a social bookmarking site for “cool” people sharing “cool” stories. It claims to help bloggers drive more traffic to their blog because they allow self promotion..
Blogbookmark - Designed specifically for Blog hunters, BlogBookmark.com claims to have the hottest news, gossip, and blog chatter from around the web. I highly suggest that mainstream bloggers bookmark their entires here. Blog-buzz - Similar to Digg, but for blog posts. Blogmarks - Save your bookmarks, tag them with keywords for easy searching amongst your list, share with others. Blogrush - The fastest and easiest way to drive traffic to your blog automatically. Not actually a social bookmark site but helps a lot in building traffic to your blog. Bluedot - Tabbed user page showing a network of friends, bookmarks, and related tags. Allows you to import contacts from all the major mail services such as GMail and Yahoo. Blurpalicious - Get Blurped! Not too different from other social bookmarks, but I love the tagline. Bmaccess - Bookmark a site, add tags, when you look up a tag, you get the names and a little thumbnail image of the site along with it. Bookkit - BookKit.com is an absolutely free web service designed to facilitate bookmark (favorites) management needs. Bookmarkall - Organizer for bookmarks, calendar, diary and knowledge. Bookmarktracker - Free online storage, management, synchronizing and RSS sharing of your bookmarks. Bookmax - You can store your bookmarks and links to your favorite sites online and access them from wherever you are : basic Social Bookmarking. Buddymarks - The online personal, group and social bookmarks manager. Bukmark - Bukmark is a social bookmarking website. Buzka - is a free and easy way to share your favorite web stuff. You can save and organize all your favorite web pages by creating Spots on any interest or topic. Chipmark - Browse random “chipmarks”, share them, sort, filter, and get personal recommendations. Citeulike - Social bookmarking for academic papers. Claimid - Manage your online identity. Although this is not a normal social bookmarking site, users can bookmark sites which reference their identity and build backlinks in this fashion. Clipclip - Like an online scrapbook, you clip out the part of the site you want, then share it with whomever you want, and discover new places to visit. Clipmarks - Allows you to clip just the chosen bits of a webpage, save them to the main website, or even insert them into your own blog. Think of it as fancy block quoting. Cloudytags - A unique word analyzer connects to your page, gets all the words and suggest you the real tags your site is showing to the world. Complore - 10MB of file storage, public & private sharing, tag cloud, popular feeds and more. Connectbean - A themed social bookmarking site for enterprise-scale business. Connectedly - Import your bookmarks, batch edit them, check in on hot topics. Connotea - A themed social bookmarking site specifically for researchers, clinicians and scientists. Contentpop - It has the latest Web 2.0 features such as social bookmarking, blogging & RSS. It also uses the word POP in the title which means it must be good. Corank - coRank is a site where you can share whatever you find interesting on the web with people who value your opinion. Crowdfound - CrowdFound is essentially a social bookmarking website, but with a different vision in mind. De.lirio.us - Social Bookmarking, Tagging, Blogging & Notes. Mmmmmm, Notes. Del.icio.us - You add your bookmarks and access them from anywhere. Check out what others are saving and see where it takes you. Digg - Synonymous with social bookmarking: you Digg a story, others Digg it, the more popular it gets the better chance it has of hitting the first page. Digmypage - Build links, increase traffic, and make money. A fast growing new social bookmark site. Diigo - Highlight portions of a page, write on it like you would a piece of paper, share with your group, and search all publicly saved pages. Dzone - Fresh links for developers. Easybm - Allows users to bookmark their frequently visited sites on their private page, allowing 1-click access to their favorite web sites. Ecites - Organize your bookmarks by tags, add comments and notes, share publicly, subscribe to certain tags so you can be notified when a new site is added that may interest you. Enroll - Social bookmarking system based in India. Entrecard - Not actaually a social bookmark site but rather a great traffic tool for bloggers. Like blogrush but in my own opinion more effective. Ez4u Social Bookmarking - Ez4u to Bookmark : “Ez4u to Organize Ez4u to Share with Others Ez4u to Remember”. Fark - Social bookmarling community. Favoor - Favoor is your personalized new start page. Collect your favorite internet addresses. Feedmarker - A free, Web based RSS/ATOM aggregator and bookmarks manager. Feedmelinks - All the usual social bookmarking goodies, but you can also add links via email. Flipskipper - social bookmarking manager that allows users to pull concurrent searches from Yahoo!, Google News, and del.icio.us when surfing. Folkd - Folkd is a social web-service about pages, news, audios, videos and blogs. Frassle - Frassle helps you read and publish weblogs, track bookmarks, and find relevant content organized your way. Freelink - Freelink.org provides free pages of links that you can access anywhere at anytime. Freezilla - FreeZilla claims to be the first Web 2.0 freebies and promotions social networking site. Fropjack - FropJack.com is a social content website and owned by the ExactSeek company. Fungow - Fungow was designed to help better organize and keep track of your bookmarks. Furl - Not only can you do the standard bookmarking and sharing, you can save archived versions of a webpage and even export all your saved pages to a ZIP file. Fuzzfizz - FuzzFizz is a brand new social bookmarking site, where users vote for the most interesting and important news stories. Gather - Gather is a place to contribute articles and content, blog, tag and connect with people who share your passions. (Plus you can link out from the articles in this authority site). Getboo - GetBoo.com is yet another free online bookmarking service which allows you to store, edit and retrieve your bookmarks from anywhere online. Givealink - Donate your bookmarks to this site to help them recommend sites and get a better understanding of how each person bookmarks. Hyperlinkomatic - Hyperlinkomatic - bookmark list manager. I89 - Export to several formats, see popular & recent bookmarks, ability to shorten URLs. Icio - Danish Bookmarking engine. Ideanotes German - Social notes manager. Easy integration of references to books, news and articles. Ikeepbookmarks - Folders, search folder names and more. Indiagram - Allows social bookmarking. Aim is to develop a community that shares information about websites on diverse topics. Jots - Jots is a collaborative bookmarking system that allows you to Store, Share and Discover relevant links. Store your own links and choose whether to share them with the world, with a select group of people or just for yourself to use. Jumptags - Jumptags.com is a revolutionary Web 2.0 social bookmarking web service for collecting, storing, sharing and distributing web bookmarks, notes, RSS feeds, contacts, and much more. Based on AJAX and other next generation web development techniques. Kinja - Kinja is a blog guide, collecting news and commentary from some of the best sites on the web. Leze - German Internet Bookmarking Service. Librarything - Deli.cio.us for books. Cataloging based on some 30+ libraries using the Z39.50 protocol. Lifelogger - LifeLogger is a great way to keep things that matter to you alive and sparkling.” And worth considering in a bookmarking campaign. Lilisto - Lilisto lets you store, manage and find your favorite links (or bookmarks) and removes the need to maintain them through your browser. Limca Bookmarks - another new social bookmarking site. Linkagogo - Favorites and Social Bookmarking Application, its unique dynamic toolbars automatically adapt themselves. Linkatopia - Keep private, share, mark as friends only, edit bookmark dates. Linkfilter - Linkfilter.net is just what the name implies, a link filter. All links are posted and moderated by users. Links can be ranked on several levels: clicks, votes, age, or a combination of all three called points. Linkkarera - German Social Bookmarking site. Linkroll - Links open in new window, subscribe to tags, browse by archives. Linksnarf - Social link sharing with groups of friends. Listerlister - ListerLister is a social list building community where you can create, add to, and vote for both lists and the items added to them. Loom Delymyth - Collaborative bookmarking application written in PHP. Ma.gnolia - Discuss all the saved bookmarks in groups, see what the Featured Linker is all about, join discussions in the Hot Group. Markaboo - MarkaBoo is tool for saving websites, files, and notes from your browser, email or mobile phone. Marktd - Marktd is a reference & voting system that highlights marketing articles considered valuable by the marketing community. Memfrag - MemFrag stores your favorites personal notes, making them globally accessible from any computer. Memotoo - Lets users centralize and share your personal data. Mister Wong - Bookmark and tag, search for tags that interest you, make buddies with people who have interesting saved sites. Mixx - An up and coming bookmarking and social news sharing network which should rival Digg, Reddit and others, Mixx blends popular photos, videos and stories. Mobleo - Allows you to easily add, organize, and share your mobile phone bookmarks with your friends using your desktop computer. Multiply - Florida-based social network Multiply, which reports nearly 3 million users and $6 million in funding,opened its social bookmarking site recently and has done well. Definite authority. Murl - My URLs is a free online bookmarks manager, think of it as a bookmarks community. Mybookmarks - MyBookmarks is a free Internet service that allows you to keep your browser bookmarks and favorites online so you can access them from anywhere. Mylinkvault - A free online bookmark manager. Other bookmark managers can be so clumsy to use - trying to rearrange your bookmarks can be slow and frustrating. Myprogs - Social bookmarking for programs you use. Mysitevote - MySiteVote is a community where you can vote your favorite site/s and view how popular a site is. Myvmarks - An online bookmark and online favorites manager. Myweb Yahoo - One button click adds your bookmarks to the search engine giants system, features duplicate detection to help you keep your bookmarks tidy. Mywebdesktop - A collaboration and communication tool, designed to be as generic and easy to use as a telephone and email. Netscape - A former contender in the browser wars, and the “mother” of Mozilla, it’s now a a social news aggregator with voting of stories similar to Digg. Netvouz - Save your bookmarks in folders, tag them with keywords, share them with others or password protect them. Networkmenus - Social Bookmarking within a web browser toolbar. Newscloud - Provides community-based media distribution services and solutions along with BitTorrent hosting and consulting for individuals and organizations of all sizes. Newsvine - Users can write articles on current news events, save links to external content; vote, comment and chat on article pages created by both users and by journalists. Newsweight - NewsWeight is a democratic news, information, and entertainment resource. Nextaris - Folders, tags, clippings; store up to 100MB for free. Oyax - A fast and quick social categorized bookmarking service with groups. Philoi - Person-to-person link sharing community. Save bookmarks and share links with your friends. Plugim - PlugIM is a user driven internet marketing community. Submit content, share articles, comment on projects and promote your favorites to the front page. If its internet marketing related, plug it on PlugIM. Propeller - One of the most active and professional bookmarking site today. 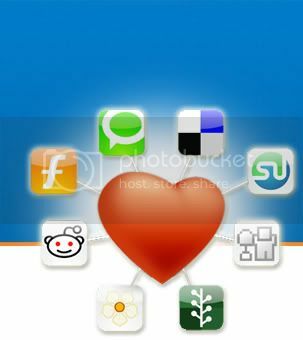 Quikieclick - QuickieClick is a second generation social bookmarking website with a visual twist. Rawsugar - Can cluster your tags for you based on recommendations by other users. Reader2 - Share the list of books you read or recommend, find new books by tags/authors. Multilanguage. Reddit - You vote up or down on a story making it move around on the home page. Searchles - Owned by the DumbFind search engine, in my opinion Searchles is a much overlooked bookmarking tool and loved by Google, Yahoo and the other major search engines with its passing of link juice and high rankings for terms within search results themselves. Segnalo - Italian Social bookmarking site. Shadows - Share your already existing bookmarks, discuss and rate sites and see what you can find. Shoutwire - Similar to Digg, except instead of “Digging a story”, you “shout it”. Still a way to vote on unique Internet news stories. Simpy - This social bookmarker does all the usual plus detects links that have changed, and distributes your bookmarks via your blog’s RSS if you like. Sitejot - Free online bookmark manager. Like every other social bookmarking site, it allows users to manage all of their bookmarks online in one convenient place. Sitestagger - SiteTagger.com is a bookmark/favorite organizer. You can bookmark websites you find on the internet via a simple button/favlet/bookmarklet that you can add to your browser link bar. Sk-rt - is a social media ranking platform of “pure goodness”, targeted towards women. Given the right story, Sk*rt can send A LOT of targeted traffic. Slashdot - The godfather of social news, SlashDot bookmarks are still quite powerful .. keep in mind the site has a heavy slant towards Linux and Open Source issues. SocialBookmarking - User and global tag cloud, blogs, social networking, avatars and more. Socialogs A Digg - like Social Bookmarking Service. Sphinn - Very popular search marketing oriented social news and discussion site run via the Pligg system. Spotback - Spotback is a personalized rating system that recommends relevant content based on personal rating history using collaborative filtering and aggregated knowledge technologies..
Spotplex - What people most read today. Spurl - You can upload your existing bookmarks to get started, add more for centralized access, check out hot lists and recommendations. Startaid - I’ve noticed that StartAid bookmark pages rank highly in Google and other search engines. This basic bookmarking service allows users to describe, tag and categorize sites. Stumbleupon - Lets you “channel surf” the Internet and review sites; it learns what you like and recommends more of the same. Sync2it - Effortless social bookmarking, millions of hand-picked sites, real-time RSS feeds, public & private collections. Features automatic clustering technology. Syncone - SyncOne is an Internet aggregator of bookmarking and browsing. tagfacts Basic bookmarking and tagging, a social knowledge base. Tagne - TagNe.ws is user-submitted, community voted links and resources related to SEO, Blogging, RSS, Tagging, Internet Marketing and more. Tagtooga - Says that this bookmarking engine can be used to discover great sites difficult to find in Google/Yahoo by browsing categories. Tagza - A very young Social Book marking web site mostly being used by Indian and Pakistani web masters. Tailrank - Tailrank finds the best content from thousands of blogs so you don’t have to! Technorati- The best place to advertise your site. Technorati is the most realibale authority in sites’ ranking. Tedigo - Personal and social bookmarking in Spanish and English made simple. Thethingsiwant - Universal wishlist service with Social Bookmarking and RSS feeds. Thoof - Add news stories you find interesting, anyone can “improve” the article by fixing the URL, editing the summary and more. Unalog - A basic social bookmarking site, but with the ability to look back at specific days and see what was going on. Urlex - Inbox, group creation, directory, all of the usual features, plus being able to send your RSS feed to the site. Uvouch - Another basic social bookmarking site, users can save their findings with one click, at one place and access it from anywhere. Voteboat- VoteBoat is a user-controlled rating and voting site. Votelists - VoteLists lets users create a list of rankable items. Other can add items, comment on them, rate them and more! Vuju - Vuju allows user to submit/publish content which can be tagged and promoted. Wazima - Coupons clipped by robots. Wazima scours the web and shows you the deals you are most interested in. Wetogether - Social bookmarking site where people will have great opportunities to promote their own sites. Wirefan - You can vote on links as well as add thumbnails for sites. Wists - Visual bookmarks, wishlists, photoblogs. Xilinus - Organize and manage bookmarks online. Yahoo Bookmarks - lets users store bookmarks using their Yahoo Toolbar and access them from any computer. Yattle - Bookmark Management and Mini-Blogging Service. Yoono - Social Bookmarking based on browser bookmarks (no tags needed), includes a search engine, an RSS Reader, web monitoring and sharing functions. Windows application and firefox extension. Zlitt - Zlitt is a social bookmarking system which gives users the opportunity to share and tag favorite news, images and videos. Zurpy - Saves bookmarks, text clippings, images, files, and news feeds in one place. Nice list for social bookmark. Thanks for sharing. Grate collection , thanks for sharing the list. This is indeed quite a comprehensive list. It sure needs a lot of work weeding out the dofollow and high page ranked sites out the entire list. Thank you for this article! It's a very nice list and still very up-to-date 2 years later. I was wondering if you knew any websites or software which automatically distribute your article to a lot of these sites at the same time? That would save me lots of times. Thanks for the answer in advance! thanks for this useful list. its very hard to find list like this whenever I visit many site for the do follow list they have written under the the niche of dofollow list but most of them are no follow thanks for this useful list. Great List! I salute you in giving effort to compile these sites and make a description. Thanks for sharing huge list of social bookmarking websites. Thanks for the list, I love to find new ways to get my blog out there and this will help alot more. Bookmarked. thank for the list. very good. Man, i must say this is a hug list of social bookmarking sites. Thanks for putting in so much time for providing us such a useful resource. I'm bookmarking this page for remembrance. Thanks for this list. Will be helpful for my link building campaign. And i would like to suggest this site jkbookmarks.com. Which is a new one.